This debut came out last year, but I only just got to it now. What was I thinking? THE BLOOD GUARD is a fantastic adventure full of twists and turns, humor at the most unlikely times, and a cast of characters you want to know more about. Thirteen-year-old, Ronan, is a rather clueless protagonist from the start, but as the story progresses he learns about the secrets his parents have kept from him. Seems that his mother is member of The Blood Guard, a secret society that keeps care of 36 people in the world known as the Pure. Their existence basically keep the world from ending. As for his father, that gets a bit more confusing. No spoilers here. With heart stopping action and some rather gruesome events, I’d reserve this one for 5-8th graders. Yes, it is intense at times, but far from nightmare inducing. Instead, you’ll be racing through the chapters to see what happens next. There are a few loose ends left dangling with this one, but more is on the way. The next book in this series, BLOOD GUARD #2: THE GLASS GAUNTLET, is released August 18th. I learned my lesson and set out to not wait a year on this one. I’ll have a review next week! FULL PLOT (From Amazon): When thirteen-year-old Ronan Truelove’s seemingly ordinary mom snatches him from school, then sets off on a high speed car chase, Ronan is shocked. His quiet, nerdy dad has been kidnapped? And the kidnappers are after him, too? His mom, he quickly learns, is anything but ordinary. In fact, she’s a member of an ancient order of knights, the Blood Guard, a sword-wielding secret society sworn to protect the Pure—thirty-six noble souls whose safety is crucial if the world as we know it is to survive. Now all those after-school activities—gymnastics, judo, survival training—she made him take, make sense. For suddenly Ronan is swept up in a sometimes funny, sometimes scary, but always thrilling adventure—dashing from one danger to the next, using his wits to escape the Bend Sinister, a posse of evil doers with strange powers. Falling in with two unlikely companions, Greta, a scrappy, strong-willed girl he’s never much liked and Jack, a devil-may-care teenage pickpocket, Ronan is left with only his wits and his mom’s last words of advice: Trust no one. That’s a lot for an ordinary kid to deal with. But then again, maybe Ronan’s not ordinary at all. I’ve read many stories of this type where the action is so non-stop that eventually it loses my interest. Not so here as writers of fantasy/adventure novels should take note at the expert way Mr. Roy handles the balance of action and plot development. The cast of characters are a true blast. It begins with Ronan and Greta but there’s more. The youngest is Sammy, age 11, and the oldest is Jack, who is the oldest teenager ever. We don’t fully understand this group, but I’m sure their characters will become even more fleshed out in the next two books. I was laughing out loud at many of the unexpected comments. The best come from Jack, who seems to be a leftover from Oliver Twist, and Ronan, who would blend into any middle school setting. They both put a light touch on some intense scenes. It’s engaging, never boring, and for reluctant readers, it might be the perfect story to get them hooked. Yes, this is another kids versus the bad’s guy story, but the fun and unique elements of this one make it rise to the top. That’s my middle name. My first is Evelyn and my last is Truelove, which is kind of a spectacular bummer on all fronts, because I’m a guy. My mom’s uncle Evelyn was from Great Britain, where I guess that name doesn’t sound weird for a boy. He had a house on a huge wooded lake in northern Michigan. So because my mom liked paddling a canoe there when she was nine, she gave me the first name that sounds like a girl’s. I can’t even begin to explain how wrong this is. “I don’t know that I ever made a conscious decision to become a writer. I just sort of always was. I wrote stories and plays all through grade school, and then film scripts and stories throughout junior high and high school. I can’t think of a time when I wasn’t working on some sort of story or other.” From Carter Roy’s web site. 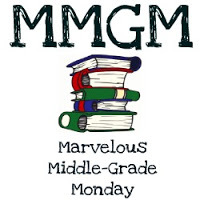 This entry was posted in Reviews and tagged Carter Roy, male protagonists, Marvelous Middle Grade Monday, MG book reviews, Middle grade, The Blood Guard series. Bookmark the permalink. Well now! Will be adding this to my to buy list for my school. 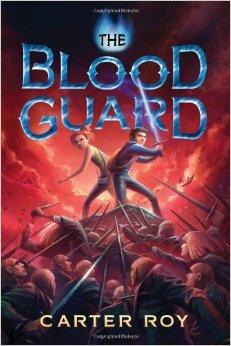 I am working on building up the books for grades 7-8 and knowing what many of them like now that I’ve been there for a year BLOOD GUARD sounds like a must get (and read!). Thanks. I’m sure they would enjoy THE BLOOD GUARD. Be sure to stop by next week for details on how to win hardback copies of both this book and the new one in the series. Glad I read your review, because I would have unfortunately judged the book by the cover — shame on me. I don’t normally review fantasy books on my blog unless I link a theme, but I enjoy reading and studying them. I will definitely check this out. Great review. I never would have picked this on up, but you make it very enticing. I hope I can find time to get to it soon. Thanks for the review. I’m not usually into these type of books but this one has some great characters. Looks as if this book is fast out the gate and exciting to the finish. Thanks for posting about it. You are definitely “super corn nuts crazy-pants” for not reading this sooner! I have the sequel already and liked it as well. You should look into Funaro’s Alistair Grim’s Odditorium, too. A touch of Steam Punk, but just very sympathetic characters. Have a great week! I love that line, too! Thanks for the recommend as I’ve added it to my list.